My Philippines adventure has come to a close. I returned to America as a smarter, tanner version of the girl who boarded the plane 11 weeks prior. Fortunately I still have a couple more Philippines adventures to document so this won’t be the last post. However, it is the end of my time in a place that now seems so very far away. And how far away it was. I boarded a plane bound for Tokyo at 8:00am on Sunday August 8th and arrived in JFK at 3:15pm the same day after a $120 fee immigration fee and 17 hours in the air. I envied the small Japanese boy in the seat next to me with his blue stripes pajamas who slept almost 9 of the 12 hour flight from Japan to the USA. I made a mental note to buy some of those pjs for my next trip. After retrieving my luggage from the not so merry-go-round at baggage claim, I made my way through the sliding glass doors and into the arms of my beaming parents. Home at last. So as I sit on this park bench with a Starbucks in hand, it seems fitting that I would return from the Philippines to the heart of America for my welcome home. 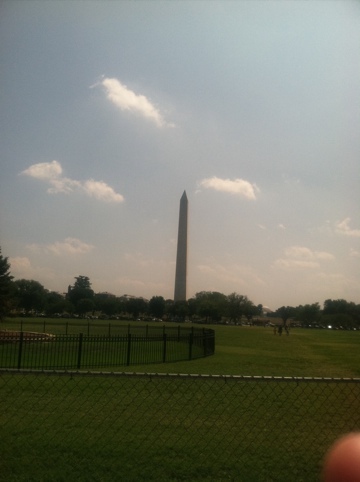 The Washington monument looms in the distance as a beacon and landmark for Americans and tourists alike. The choreographed ebb and flow of pedestrian traffic is accompanied by foreign tongues, languages I recognize and many I do not. I know this city, understand the street grid of lettered and numbered streets extending outward from the capital. The red line still connects Tenleytown to Farragut North, my daily commute as an intern last summer. Cities, like old friends, can be loved and missed. There are just 10 months between me and college graduation. I cannot imagine where I will be next summer at this time. A job? Applying to law school? Either way I can count on Abraham Lincoln and that iconic stone monument to welcome me back, whenever that may be. And some non-iconic almost monuments to welcome you back. Glad your home and well done Kate.